Every invention changes the world a little bit, but the telescope did far more than thatóit changed the way we perceive the universe. Panek (Waterloo Diamonds, 1995) takes as his starting point the year 1609, when Galileo first turned his telescope skyward and recorded what he saw. The instrument itself, two small lenses in a metal tube, could have been built two or three centuries earlier. But what Galileo saw through it brought a revolution. Light and dark spots on the moon were mountains, valleys, plains. The planets displayed discs like the moon. The obvious conclusion was that they were worlds like Earth—and thus Earth must be a planet like the others. The philosophical implications that led to Galileo’s confrontation with the Church are well known. 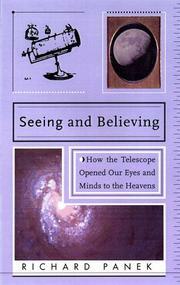 But Panek also shows how the future of astronomy was changed. Increased use of the telescope brought home the need for a new standard of accuracy in measurements. At the same time, improvements were made in the telescope itself, improving both its magnifying power and its ability to gather dim light. Until modern times, the single greatest improvement was Newton’s replacement of the primary lenses by mirrors, which led to a huge jump in the size of instruments. With each improvement, the universe grew and changed—from Herschel’s discovery of the first new planet to the 40 billion new galaxies discovered by the Hubble Space Telescope in 1996. Panek shows the philosophical implications of each wave of discoveries, especially their effect in removing the human race from the center of the universe. The relationship between the growing body of astronomical data and the theoretical apparatus needed to explain it—here again, Newton’s contribution is seminal—also receives due attention. A good brief history of scientific astronomy, with the focus where it belongs—on the instruments that have brought us the knowledge of the stars.